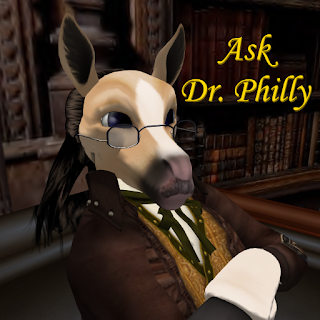 SL Newser - People: Ask Dr. Phily: "Between a Rock and a Shady Place." Ask Dr. Phily: "Between a Rock and a Shady Place." Through some misunderstandings, I feel that the administrators of the sim and some of the residents are angry at me and want to do me harm. I have taken this up, with those in charge and been told I can stay, but still feel unsafe in my home. I am just a little guy. What can I do to get out of this mess? Can I call you A? I'm going to let you in on a very little known important secret on how things get done, anywhere in the universe, RL and SL included. Everything in the universe that we call "matter" has it's roots in an idea that mattered. That idea inspires minds to create images of it. We call that "Imagination". Our feelings enthusiastically take up these images and create electro-magnetic meshes which draw pre-existing matters to give the original idea a solid form. Long story short, everything that's happening around us is being cooked up in our imaginations, like it or not. Don't just take my word for it. You have to prove it for yourself. I know you have an imagination, or you wouldn't be in SL. Put and develop in your mind the image that you are "That Guy". That guy, who everybody likes and respects and says hi to, when he walks in a room. That guy, that everybody is friends with and smiles every time they think of him. Keep your image free of any negative qualities. Have good, happy feelings about your image. When the image and feelings are complete, drop it, forget about it. Right on time, you will become "That Guy"
I have an anoying new neighbor, that's driving me and my friends nuts. Whenever he's around, it's always talk about doom and gloom, we're all gonna die. Dude, it's a GAME, get over it! If I ban him from my home, that would only add more stress. Can you give me a more civilized way to handle this guy? I think you will like my "High Tech" methods of handling group conflicts. In the process, we'll also share some ideas about how time works. We'll check the weather forcast, before we proceed. When it comes to predicting the path of dangerous storms, Meteorologists use "computer models", which can be run using a different set of "what ifs", hundreds of times per minute, ending in the most probable path. The actual storm path takes days to finish. The computer model path takes a nano second. Same paths, different time scale. If we step back and take a look at Second Life as a method of running computer models of interpersonal relationships, we can find the shortest behavioral path to a "happily ever after" civilization. In a one hour movie or TV show, all the events shown cover more than one hour's time. For the person at the keyboard, the soul of the avatar, an hour of movie or an hour of SL both offer the same amount of new experience. The added advantage in SL is that we each write our own lines, in each new daily episode of a sitcom and the length of time you spend in world is equal to one day's experience to both the avatar and it's soul. This accounts for why we have all felt that time is faster in SL. We are all variables in a computer model society. We can write our own scripts, but not those of others. Over time, we can influence what others write. The important trick is, don't keep playing the same re-runs each day. With each new episode, make your av say and do things that might help steer the show to a happy ending. With a little practice, you WILL get good results. Open your shades, your front door, hit [Ctrl]+[Shift]+[Y] and let that SLun shine in.